Ewyas Lacy is in Border country. Border country is by its nature often disputed and so it was in the years before and after the coming of the Normans. Before 1066 the lands of Clodock were held by the Welsh Princes but being subject to pressure from the Anglo Saxons in the Golden Valley. William the Conquer gave the lands of Clodock to one of his Barons, Hugh De Lacy. It was a cheap gift, since the lands had not been held by the Anglo Saxon King Harold and so in a way, were not William’s to give. No doubt this fuelled the old disputes and we know that the Normans in the Marches needed Castles to feel secure. Newton lies on the eastern or Anglo Saxon side of Ewyas Lacy; it broadly occupies the ridge between the Eskley and Dulas rivers. It has been known as ‘Newton’ for perhaps about 1200 years. The two name elements “New” and “ton” are both Saxon in origin and the name can be translated as “The recently established Settlement”. The Saxons had spread westward across England. By 800 AD they were firmly established in Hereford and 200 years later under the rule of the House of Godwin had spread to the Golden Valley. At the time of the Norman Invasion (1066) the Golden Valley was regarded as the Frontier of England. Lands to the West, including our present Clodock area, were ruled by the Welsh Princes. It is therefore safe to assume that the name ‘Newton’ was given to the area by the people of the Golden Valley to mark their own recent inhabitation of the area. The earlier name for the area is the Welsh ‘Maes-Coed’. Welsh place names are mainly descriptive in origin and Maes-Coed means ‘The Meadows in the Wood’, probably a very apt description of Newton in the years before the coming of the Normans. The Maescoeds were originally medieval clearings in the woods between the River Escley and the Dulas Brook. An early deed of 1615 gives an alternative name for the Middle Maescoed as “Urescoed Gennoll”. This is again from the Welsh, Urescoed meaning the “Field in the Wood”, and Gennoll “The one below the Upper”. Under the pressures brought about by settlement these clearings became enlarged Commons or pastoral waste and eventually almost continuous in extent. The name is spelt in different ways at various times and places. Some variants include; Maescoed, Maes-Coed, Mescott, Mescot, Mescoed, Mescod, Mescodd, Mescoedd, Mescode, Maescod, Mesecode, Mascoyt, Mascoit, Mescoid, Maescot, Mescoyde. The local pronunciation is ‘Mescott’. Here the generally accepted modern spelling of Maescoed will be used. The earliest documentary evidence is from the 13th Century when the Monks of Dore Abbey had the right to gather fuel and timber and to graze pigs on the Commons. Maescoed still occurs on modern maps in three forms as Upper, Middle and Lower Maescoed without being very clear where one ends and the next begins. Why are there 3 Maescoeds? Why not 2 or 1? The separation may date from division of de Lacy lands in the 13th century by inheritance to the two sisters Maud and Margery de Lacy. The two shares were not in compact blocks but split into multiple pieces, subsequently to be held by separate Lords of the Manor . Each was also subject to a differing management philosophy that shaped the nature of the manors. In Newton, Margery had the Lower and Upper Maescoed and Maud the Middle Maescoed. By the 18th century the Marquis of Abergavenny and his family had managed the former for more than 200 years, while the Jefferies family of Brecon had recently acquired the latter. And so today the manor records of one are held in the Gwent Record Office and those of the other in the Hereford Record Office. It would appear that the stewards managing the estates of the Marquis of Abergavenny had an eye open for income, and in the18th century would grant small leasehold plots to those who could afford them. Hence his Maescoed lands were split into numerous but very small cottage holdings of an acre or two. The field pattern this created is very distinctive and can easily be seen on large-scale maps or aerial photographs. 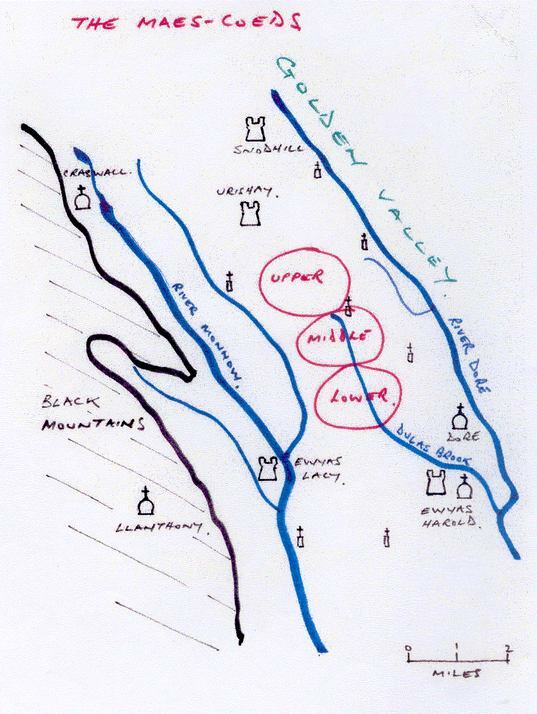 Eventually the Herefordshire Estates of the Marquis of Abergavenny including those of the Lower and Upper Maescoeds were sold at auction in 1920. Lands on the Middle Maescoed were subject to enclosure from two main sources. Firstly there were the surrounding farms on the periphery; these were mainly freehold and would have been granted as a 20 –30 acre holding at an early date. Then as farming changed from a subsistence base to one of supplying produce, more land was both needed and could be worked. These periphery farms grew in size by taking in parts of the Common either by Lease or in a minority of cases by further freehold purchase. Enclosure of the commons was mainly piecemeal and progressive. It follows that the extent of open common or waste changed over time. Residual open Commons remain in both Lower and Upper Maescoed. That of the Middle Maescoed was finally extinguished by Act of Parliament of 1816. Careful study can reveal the form and extent of these Commons.